Lately I have been seeing a lot of recipes containing Biscoff spread on Pinterest. 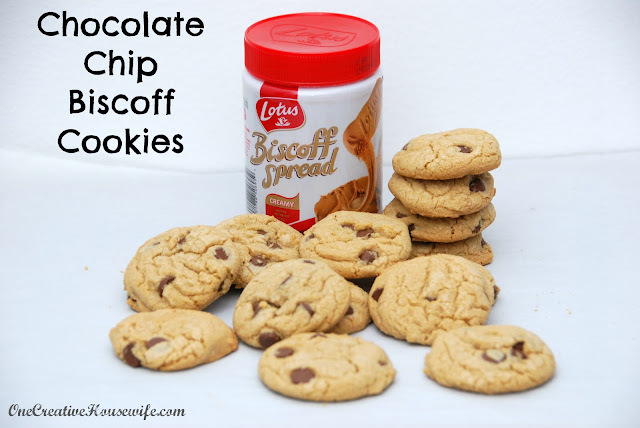 At first I thought nothing of it, then I started seeing coupons and sales for the Lotus Biscoff Spread*, so I picked up a jar. That jar has been sitting in my pantry for over a month, but I finally decided to use it to make cookies. I was actually surprised how good the cookies turned out. When my kids tried these cookies, my daughter actually asked, "How did you make them taste so good?" 2. Cream butter, and Biscoff spread together. 3. Add brown sugar and granulated sugar and cream again. 4. Add eggs and vanilla and mix well. 5. Add flour, baking soda, and salt and beat together. 6. Mix in chocolate chips until evenly distributed. 7. Drop by tablespoonful on to parchment paper lined baking sheet. 8. Bake for 8-10 minutes. The cookies will be soft but you want them that way!! 9. Allow to cool on baking sheet for 2 minutes. Then place on a wire rack to cool completely.